TORONTO -- Just days after arriving at a refugee camp in southeastern Turkey, Dilaver Omar and his family were taken in by locals who helped them adjust to their new life away from home. A year and a half later, as Omar, his wife Dilsah Sahin and two of their children prepared to come to Canada through the government sponsorship program, they were told a family would be waiting in their new country to show them the lay of the land, he said through an interpreter. 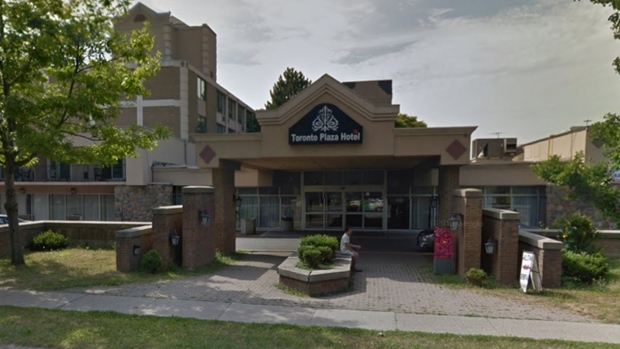 Instead, the couple and their children -- 11-year-old son Beyez and 19-year-old daughter Hozana -- have spent the last few weeks in a north Toronto hotel that has become a de facto settlement for hundreds of government-sponsored Syrian refugees who have yet to find more permanent homes. Eager to start their new lives and see their children back in school after a two-year hiatus, the parents said they long to move out of the crowded hotel. "All I do is dream about having a home," said Omar, 45, noting the constant bustle of the building has grown to be "too much." On a recent afternoon, dozens of people milled about the lobby, intercepting busy-looking settlement workers while young boys kicked a soccer ball in a corner. Children ran down the halls pushing toy shopping carts or strollers, while three young girls dressed in matching pink coats and boots played with the guest phone. When they first arrived at the Toronto Airport Plaza Hotel -- the family shares adjoining rooms, each just large enough for two queen-size beds and a few suitcases -- other refugees warned of long processing delays, Sahin, 44, said in Arabic. Settlement staff are doing what they can, she said, but it would be so much easier with a local family to show them the way. Nour Daoud of COSTI Immigration Services, who is handling the family's file, said the intake and orientation process can take some time. Families might miss an appointment for a health card while out looking for a home, she said. Housing is by far the biggest hurdle, she said, since many landlords require refugees to have someone co-sign their lease. And without an address, parents can't get their children in school. But to her knowledge, no one has stayed in the hotel longer than a month, Daoud said. More than 15,300 Syrians have arrived in Canada since the Liberals came to power, of which 8,859 are government-assisted, 5,426 privately sponsored and 1,081 a blend of the two programs. The influx has forced agencies in three cities to request a break in the action so they can hire extra staff and find permanent homes for those who have already arrived before any more are cleared to come to Canada. The federal government has said the flow will not be slowing down, but refugees already in Vancouver, Toronto and Ottawa have been staying in hotels for longer than expected. Ontario Premier Kathleen Wynne suggested private sponsors could temporarily house government-sponsored refugees currently living in hotels. But Ottawa found too many flaws in the proposal, saying the federal government has a duty of care over government-sponsored refugees, and that refugees shouldn't have to move to one home, only to move again soon after. Humaira Khan, who runs Partners in Humanity, said sponsorship groups like hers don't want to replace government efforts to help refugees, just supplement them. The Toronto-area realtor has been helping families at the Plaza hotel find rental homes while waiting for the refugees her group is sponsoring to arrive. "These people need us now," she said. "They're desperate." Just this week, Khan helped a family of nine sign a one-year lease on a townhouse in Mississauga, west of Toronto. Locating a home large enough for the couple and their seven kids -- aged 4 to 14 -- that was also within their limited budget was difficult, and took several visits over the last few weeks, she said. She even managed to find a race car bed for one of the boys, who had raved about the novelty item, she said. Seeing his face light up at the sight of his new bed was "a fairy tale," Khan said. Two more families, one with five children and one with eight, are also house-hunting with Khan's help, she said. Once they have settled in their new places, Khan said she hopes to arrange at-home English classes for the mothers, who may not be able to attend otherwise. A sponsorship group formed of co-workers at the Lough Barnes Consulting Group has been waiting for months to be assigned a family, and has already figured out who will pick them up at the airport, stock the fridge and handle everything else that will come along with the mammoth task of settlement. In the meantime, however, they are flexible with helping whoever is in need, said Steve Lough, the company's managing director. He said they trust those in charge to know whether it's best to stick to the different refugee streams or to start some cross-pollination. "They're all in need. If they can come faster government sponsored, if we can get them settled faster with private, what difference does it make?" he said.